If you are looking to buy a telescope, then hopefully this Orion Skyquest xt8 review will help you make your decision. 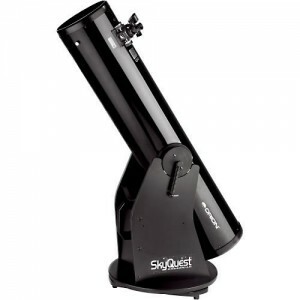 The Orion Skyquest xt8 Dobsonian telescope has proven to be a very popular reflecting telescope, especially among beginners. It’s 8 inch diameter offers a large aperture at a very affordable price. Having such a large aperture allows it to let in more light. This is a real bonus if you intend on using it in urban areas. Light pollution (light spilling from surrounding streetlights, buildings, cities etc) wont be that much of a problem as a result of this larger sized aperture. It wont interfere as much with the image you see with the telescope. The image wont appear as dull and washed out as with other telescopes with smaller apertures. There is a small finder scope included which makes it easy to locate objects before you look at them with the xt8. This saves you from wasting your time hunting across the sky with it trying to find that distant planet you want to look at. It comes with a 25mm eyepiece included. So you can see the cloudy atmosphere of Jupiter, the rings of Saturn and even the colors and beauty of deep space objects such as nebulae and galaxies, right in your own backyard. Focus your telescope a little closer to our own neighborhood and you can watch the moons orbiting the nearby planets. The moons of Jupiter are fun to follow over consecutive weeks as they change their orientation around the planet. Or you can easily pick out the craters of our own moon in sharp detail because of the sharpness of the optics used. This is also a great bonus if you would like to take up astro-photography. If you want, you could even hold your digital camera or iPhone up to the telescope and take pictures, or video, which is real fun. The use of the simple dobsonian base means that better quality optics have been able to be used without pushing up the price. The sturdiness of the base also makes it great for taking photos. The photos you take will make a great photo hanging on your wall! Because of the dobsonian base, this simple sturdy design is not only very easy to assemble out of the box, (there are easy to follow instructions included) but is very durable, and able to with stand a few knocks against doorways etc. It is also a very stable mount, so you wont have to worry about wobbles and shakiness while you’re viewing the sky. This is a major benefit of having a dobsonian telescope, you get a nice sturdy base, which makes the image that little bit clearer. Because this is a reflecting telescope, it contains internal mirrors. These will need to be aligned (known as collimating) from time to time, as they may slip out of alignment due to shipping, knocks or bumps or even the expansion and contraction of the metal casing due to changes in temperature. This is an easy thing to do that should only take a few moments. There are simple instructions and tools included in the box to do this. You can also purchase a laser collimating tool to help you, but it is not absolutely necessary, it just may be more convenient for some people. Because of its large size, it may be a bit on the heavy side for some people to move around, but this also makes it sturdy. However the xt8 is also just as easy to disassemble for transporting because it is a dobsonian telescope. There is an optional padded carry bag available which some people have found makes transporting much easier. There is also a myriad of accessories to expand the xt8’s capabilities further. Eyepieces, barlow lenses and filters are just some of them that will enhance your star gazing hobby even more. There are also specialized cases to protect and transport your telescope. There is a list of popular accessories at the bottom of this Orion Skyquest xt8 review, you may consider grabbing some of these. You do not need to purchase any of them, but like all accessories, they will give you more options or make things more convenient for you. This is a great telescope for you whether you are a beginner or a more experienced user. The simple base has made it a very affordable and usable telescope. This has made it possible to include better quality lenses with out increasing the price. It is nice and sturdy and capable of providing you with nice clear images to keep you busy for hours on end. You can get your Orion Skyquest xt8 at Amazon, by clicking here. The Orion Skyquest xt8 is available at Amazon, by clicking here. May be heavy for some. The following is a selection of feedback from people who purchased the Orion Skyquest xt8 on Amazon. You can get the Orion Skyquest xt8 at Amazon, by clicking below. If you found this article helpful, could you please share it….. This entry was posted on May 17, 2012, 11:26 am and is filed under Telescope Reviews. You can follow any responses to this entry through RSS 2.0. Both comments and pings are currently closed.